I climb on the seat and ease in the clutch pedal. Then I slip the choke forward, make sure the gearshift is in neutral, bring forward the hand gas feed, and hit the start switch. The tractor roars to life and settles into a familiar purr. I return the choke to open, throttle up the hand feed a bit more, and slowly ease out the clutch. The rig rolls forward taking up the slack between it and the plow hooked to the 3-point. All the way off the clutch now and I’m quickly cutting a deep furrow in a perfectly straight line adjacent to the other furrows already turned. It’s farming just like my ancestors have done since the invention of the tractor—except my machine is only slightly larger than my riding mower, and my “field” is my 30-by-50 foot vegetable garden. We all know the scenario. There are some homesteading projects that exceed the limits of the hand tools we used to use, but they don’t justify the financial investment in a tractor and farm implements—not even a small used tractor and second-hand implements. [But, it’s much more affordable than say, buying a Viking Yacht For Sale.] Using wood for heat and even cooking is much more enjoyable if you can easily move the fuel source from the woodpile to the woodbox without overtaxing your back. Leveling ground to create a more enjoyable and usable lawn, or planting food plots to attract wildlife, can become a hobby as opposed to a drudgery. There’s another alternative to that big tractor investment… a garden tractor. These mini-workhorse machines are compact, powerful, and extremely cost effective for anyone looking to handle increased outdoor chores without going into full-blown farming. They can easily move more wood at a time than anyone can wheelbarrow. They plow and dress the soil faster and easier than a walk-behind tiller. With a garden tractor you can grade the driveway, push or blow snow, de-thatch the lawn, or put in a food plot for wildlife. They’re sturdier and much more useful than a lawn tractor, but considerably smaller and more sensible than a full-sized tractor for the serious gardener or homesteader looking to really work the land. Garden tractors can do anything a full-sized tractor can do—just on a smaller scale. Garden tractors are superior to lawn mowers in construction and ability. Note the mower’s lightweight rear bumper versus the tractor’s heavy construction and 3-point hitch setup. In fact, I own a full-sized tractor but often leave it parked in the garage in favor of using my rebuilt 1979 Sears Vari-drive garden tractor. The machine is small and easy to climb on and off. The implements are sturdy—I’ve never broken one despite hard use—but they’re still small enough I can move them around easily by hand. And my garden tractor doesn’t pack down the freshly-turned soil in our garden like the full-size tractor does. I also own an ATV, and while it’s every bit the size and power of the garden tractor it isn’t equipped with a 3-point implement attachment and doesn’t have a mower deck. A good used garden tractor is an inexpensive, reliable, enjoyable help around the property. Garden tractors first came into being in the early 1900s as two-wheeled machines to make small farm work easier. The walk-behind machines could cultivate soil, sickle cut tall grass or take down small trees with a horizontal saw blade. Over they years they evolved into ride-on machines, then eventually faded in glory at a time when people were choosing either to live in suburbs with manicured lawns, or stay in the country and farm full-time. The suburbanites had no need to work the soil except to finely trim the lush green grass, and therefore evolved to using lighter, less expensive lawn tractors. Nowadays, most new lawn mowers have the engine in the back and in no way resemble a tractor. On the other hand, farmers were forced to continually increase productivity to be able to stay profitable and keep their land safe from creditors. Even for small farmers that meant larger and larger machines capable of doing twice the work in half the time because, after all, they couldn’t afford to hire more workers and eat up a dwindling profit margin. By the latter 1900s there was little middle ground between the two groups—urbanites and farmers. 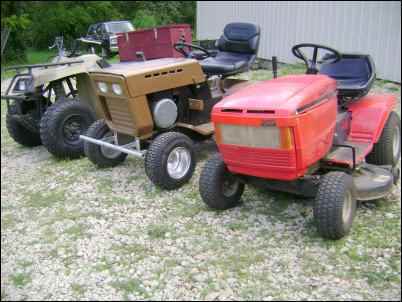 Here you can see how a garden tractor compares to a lawn mower or ATV in size. But don’t let the size fool you, because these little workhorses are doggone tough. But that has changed in the past decade. A group of us are choosing to exit the suburbs and take up a place in the country on land we can till, work, smell and feel again. A couple years ago an existing movement began gaining some serious momentum. The gist of the move was to begin “eating locally”, or consuming only food items grown or raised within the immediate area. What’s more local than your own back yard or “back 40” acres. More and more people have chosen to turn away from the concrete jungle and get back to the country, and not just the “eat local” folks—who, by the way, are commonly referred to as “locavores”. Some of those who remained in the suburbs are choosing to turn a portion of those manicured backyards into gardens where they can once again have some idea of where their food comes from. In either case, the lowly garden tractor is a sleeping workhorse worthy to be considered. The title “garden tractor” denotes a style of compact, ride-on four wheel tractor. 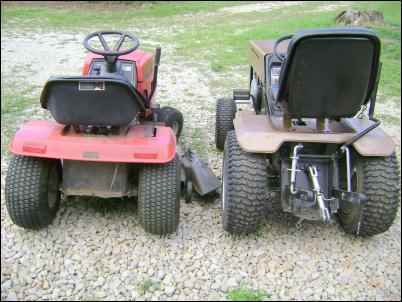 While most garden tractors are equipped for a mower deck, they are far superior to any riding lawn mower. They are built sturdier, with a stronger steel frame, and have a transmission and rear differential (axle) which can take a lot of abuse. The main visible difference is that a garden tractor will be equipped with a 3-point or other system to allow for attachments—such as plows, discs, a harrow, cultivators, a lawn rake, tiller, sickle mower, etc. Most are also equipped to handle a snow blade, dozer blade, dirt scoop, or a belt-driven or self-propelled snow blower to be mounted on the front. And don’t forget the heavy-duty steel mower deck that quickly connects and disconnects down below. Beneath the hood is where you’ll find the one- or two-cylinder gas engine and usually the battery and fuel tank. Let’s get something clear here. The garden tractors we’re discussing are not the mid-sized, 3-cylinder diesel, 4-wheel drive, foreign-made small-bodied tractors which have flooded the marketplace in recent years. While those tractors may have their place in the hobby farm market, their new cost is often steep—comparable to a good used full-sized tractor (starting at about $4,000 and going up from there). A fine used garden tractor can be found for starting at about $400. Most used implements will run between $25 and $250. 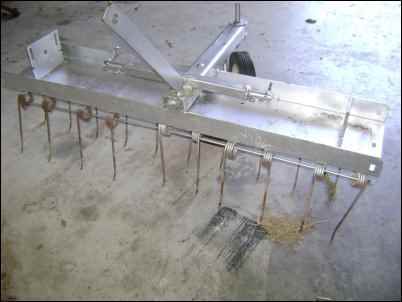 As an example, I sold an extra Brinley plow last week for $60. Most garden tractors rely on one- or two-cylinder gas engines for power. The engine will sit in the front of the driver beneath a sheet metal hood. That’s often where the fuel tank and battery can be found as well. Most garden tractors have between three and five speeds, including a reverse. Many have an additional 2-speed rear axle or reduction gearbox ahead of the rear-end. That reduction option greatly increases the horsepower at the wheels. Most tractors, although antiques technically, will have the convenience of an electric starter. Most also have headlights for working before or after dark. 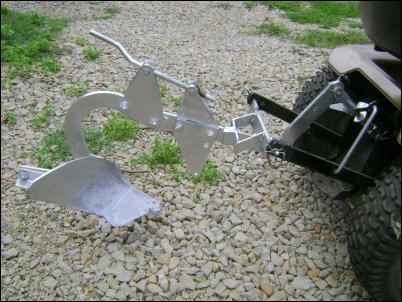 A plow is only one of a long list of attachments which can be bought or made to work on a garden tractor. You can also find discs, cultivators, dethatchers, lawn rollers, blades, snow blowers, sickle mowers, and more. The goal of this story is not to explore the history of the many companies which have produced garden tractors. Just let it be said that in addition to Wheelhorse, Gravely, Bolens and Simplicity (names synonymous with garden and lawn tractors), larger tractor manufacturers including International Harvester, John Deere, Case, Massey-Ferguson and Ford have all dabbled in the garden tractor market. Earlier I mentioned how garden tractors evolved out of two-wheel walk-behind tractors. Those earlier machines were a giant leap in power and convenience when first introduced. Now you could use a machine instead of a horse to plow the garden, pull a disc, and do some of the smaller farm and garden chores which had previously required more labor than was comfortable by hand, but less than what was required for a team of animals. It didn’t take too many years until the two-wheeled workhorses grew a front set of wheels and evolved the handlebars into a steering wheel and seat and became a ride-on garden tractor. Many of these small machines are still out there and available for a reasonable price. 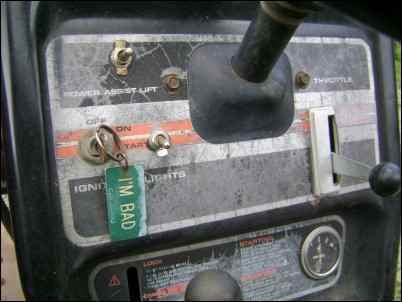 The dash of a garden tractor usually houses the ignition switch, light switch, hand throttle/choke control and gauges. This model also houses a parking brake. The key fob tells the real story. Connecting implements to a garden tractor is a simple task nearly anyone of any age or health condition can accomplish. Rear implements such as a plow, discs, cultivator, lawn roller, dethatcher, gravel blade or others connect with the two lower lift arms and a top link, the same 3-point set up as a larger tractor. Some garden tractors will have a simple lever to raise and lower the implements, while other models like my 1979 Sears machine come with the option of an additional small electric actuator motor, or lift assist, which is operated by way of a toggle switch on the dash panel. 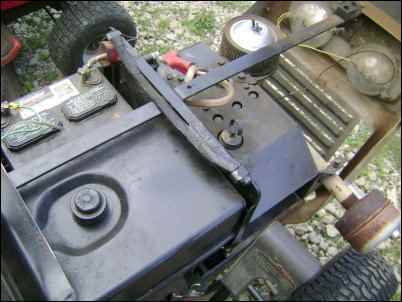 Snow blowers and other front-mounted implements are usually bolted or pinned in place with power provided by a belt which fits through a slot in the front grill. I have my tractor modified to accept a detachable bracket which allows me to hang a heavy steel tractor weight well out in front of the machine. A few weeks ago I accidentally flipped my little tractor over backward while pulling a full-sized utility trailer (the one I usually pull behind my truck to haul my tractor or ATV) full of firewood up an embankment. The accident occurred because of my own stupidity due to the way I had the trailer attached to the tractor. Fortunately the full-back padded seat I have mounted on the little tractor held it upright and allowed me to escape unscathed. While the rollover accident could have been much worse, even fatal, it only worked to prove the amazing power of these little tractors. It also proved how tough they are. After my incident, I stood back up, wiped off the grass and dirt and nursed my bruised ego for a moment, then grabbed the front bumper of the tractor and simply pulled it back down toward the ground. The engine fired up and hasn’t missed a beat since. As with the use of any power equipment regardless of how large or small, safety must always be foremost in the operator’s mind. Among the long list of 3-point accessories for garden tractors are dethatchers such as this one. You can also buy or adapt lawn rollers, plug aerators, seeders and sprayers. And most garden tractors are built to use a belt-driven belly mower. I mentioned several attachments and optional items that came with garden tractors but the list goes on and on. I’ve also seen and own some chrome accessories. Some manufacturers also offered wheel weights, supplemental weights like the one I have for the front to add extra downforce, umbrellas, and even converters to add dual wheels on the rear. If you’re handy with a welder or basic shop tools you can make or fit nearly anything to one of these little workhorses. I’ve seen 3-point carryalls, dual wheel conversions for front wheels as well, flail-type mowers, finish mowers, roll bars, utility trailers and sleds, tire chains, a mini-hay baler, and even a firewood cutting saw that mounted on the front and ran off a belt like an old-time sawmill. As a kid my grandpa had a similar saw mounted on the front of one of his tractors that we used for cutting firewood to length. So as the chores you do on your land continues to grow, and we all know they seem to year after year, consider the good supply of vintage garden tractors that can found at reasonable prices. Search out the Internet, used lawn and garden equipment dealers, or try small engine shops. These machines are well worth a look.